Stress. We probably all have or will experience it at some time in some way, shape or form. Thankfully yoga can be a saviour in offering us support and helping us to deal with the times when the going gets tough. 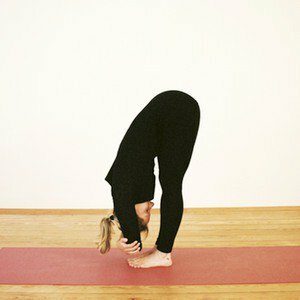 After a bad day at work or in those moments of overwhelm, give these yoga poses for stress relief a try to help you destress your day the yogic way. Combine them with full, deep yogic breaths and feel the tension melt away as you bring yourself back into a place of balance and calm. If you’re feeling the need to hide away, Child’s pose is the perfect place in which to rest and recover. Allow the rest of the world to drift away as you draw your awareness inwards and relax here for a few moments, enjoying the feeling of surrender, peace and quiet. How to do it: Stand up on the knees and then gently start to sink the buttocks back towards the heels and rest your torso forwards over the thighs. The forehead will either rest on the floor or you can make fists with the hands and rest the forehead on the fists. The knees can be together or separate and the arms out in front or down b the sides – whatever invites in more ease. This is a delicious pose that invites in release, surrender and a real sense of letting go. Try bringing one hand on to your heart and bring your awareness back into your heart, back into what is really important. You can also place the other hand onto the belly to ensure that you are taking full belly breaths to help you relax deeper. How to do it: Come down to lie on your back. Bring the soles of the feet together and let the knees drop out to either side. If the hips feel particularly tight, slide the heels a little further down away from the body. Let the arms just drop out to each side with the palms facing up. This is one of the very best poses to help relieve anxiety, mild depression and fatigue. As well as being deeply calming, this beautiful pose allows fresh blood to flow easily to the brain, cleansing and refreshing the brain. How to do it: From standing tuck the chin in towards the chest and slowly roll yourself down as far as you can go. Once there, grab hold of opposite elbows and allow yourself to hang. If you’re in overwhelm and need a few moments of peace, this deeply restorative pose will help calm the mind, relieve anxiety and completely relax the entire nervous system. How to do it: Sit next to a wall with one of your hips resting next to the wall. Gently swing your legs around until they are up the wall with the backs of the thighs resting on the wall. Then slowly lower yourself down to lie on your back. Make sure your buttocks are as close to the wall as possible and rest your arms down by your sides with the palms facing up. 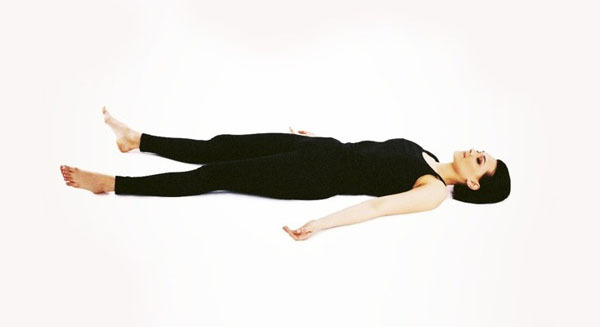 The ultimate relaxation pose, Savasana is a time where you simply allow yourself to be. No more doing, going, rushing or stressing. In Savasana, you simply allow yourself to BE. Savasana helps to calm the entire nervous system and induce a deep state of relaxation but most of all savasana helps to bring you back to yourself. How to do it: Lie down on your back with the arms and legs straight. Take your legs slightly apart and allow the feet to fall out to either side. Keep your arms down by the sides, slightly away from the body, palms facing up. Relax the shoulders away from the ears and allow the whole body to completely relax as you soak in a final few moments of bliss. I hope these poses help you to restore balance, equilibrium and peace into your daily life. I’d love to hear your experiences or any other poses that help you to find balance, peace and calm — sound off in the comments below!